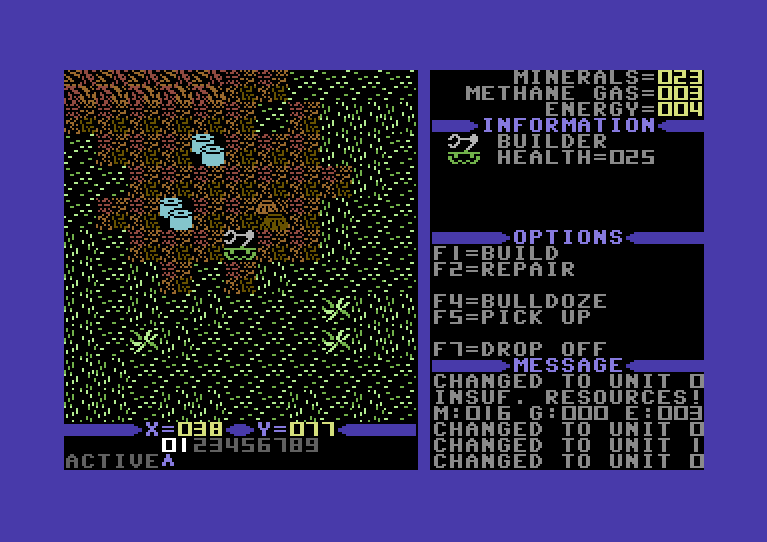 Similar gameplay concepts, which should be familiar to players of StarCraft, Warcraft, or Dune II. Original soundtrack for the SID chip, as well as an included cassette with Roland MT-32 and Adlib versions. Can I play it in an emulator? – Yes, you can! A digital copy will be emailed to you as soon as you purchase, which should run in VICE or most any other emulator. Will you provide a digital-only version for less money? – Not at this point. I invested a lot of money up front on the boxes, tapes, disks, labels, and manuals. I need to sell most of those first. After that, perhaps I will offer a cheaper digital option. Will you ship to my country? – For the most part, yes. European customers should buy from EOX Studio’s. Otherwise, I will ship to most other countries. Will it work on SD-2-IEC? – Yes. There is no copy protection in the game (rather pointless these days) so it will load from anything, even drives like the 1581 or other non-1541 compatible drives. 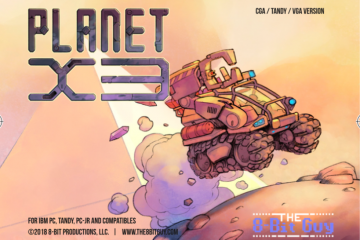 Just wanted to say that Planet X2 is an awesome game! I think it’s the first C64 game that I’ve purchased since the late 80’s! It’s quite addictive and has a lot of legs in terms of game play. I played it on my PAL modified C64 (with Jiffy DOS and an SD2IEC) even though I purchased the US version and the gameplay is spot on. Looking forward to getting the box with all the goodies inside. FYI there is a typo in the FAQ. 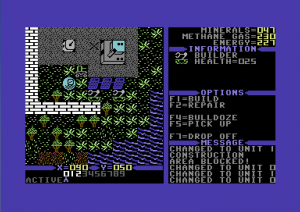 A toy, it is wrong to call the C64 a toy, and indeed it was and is a problem that people did/do view the C64 as a toy. Commodore was a pioneer in computers for the home market and they understood that entertainment capabilities were important for the home market. The computers however, were intended for all kind of computer usage at home. That machine is ready to start programming in BASIC and that a large part of the user manual is devoted to learn people programming in BASIC is an important hint to how the computer was intended. If you never used a Commodore 64 I can absolutely recommend it. It is a computer with an incredibly rich software collection and user community, in the past but also in the present. Games are fun, software is interresting you wilkl learn how versatile it is. Often the experience is pure magic. the game seems to be sold out. Is there a chance to buy it now and get a digital copy to play on Vice or another emulator? And maybe have the box with the game shipped to my location later when it is available again? Ditto, it was sold out before I saw the video on youtube! I would love to purchase a copy. Game looks cool. I recently got a C64, but I don’t have any games for it. I know my wife bought this for me, but she won’t let me have it till Christmas. 🙁 O well, don’t really have time to play until then anyway. Basically, this will be my first C64 game ever! I would love a tape version of this (us Brits could never afford the disk drive). Will you ever consider releasing one for us PAL guys? Planet X2 will work on PAL systems. But tape would be a problem because random-access is required to load the maps. Any prospect of a digital only option, since the boxed ones seem to have sold out now? I would like to play this on The64 Mini so a digital version would be great, plus a PDF manual. Would it be possible to use the tape counter to start loading the game at level X or Y? In theory.. but it would require a lot of re-writing of code. 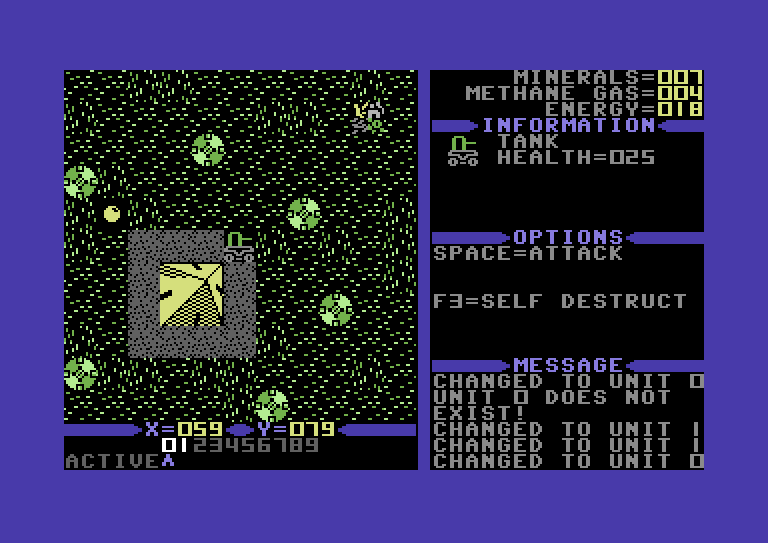 In relation to Dan T’s comment about starting the game at level X or Y, if you really wanted to do a tape version of Planet X2, the easiest way to do it would be to write it as two separate programs; one for each side (i.e. if you wanted to play level X, you would have to load the game with the “X” side up and vice versa). I’m no C64 programming expert but gathering from the information I read here, that’s the only possible theory that I can think of. Indeed this is a marvel of programming, and I commend you. Reminds me of the 8 bit age, I’m going to repurchase a c64 off eBay, thanks for the memories, I’m at windjammerhobbies@gmail. Com and I was one of the founding members of Excalibur 64/128 club found in the Compute! Magazine, all members are still alive, and all still do 64, either frodo, or other ways. We all still program 6502, and 68xxxx! Thanks again, i’ll order soon, my C128D still works, but not sure if its comparable, need a c64 anyway! I haven’t bought it yet, but it looks interesting and seems like a great game. I just have one suggestion that you might want to consider for your future games. 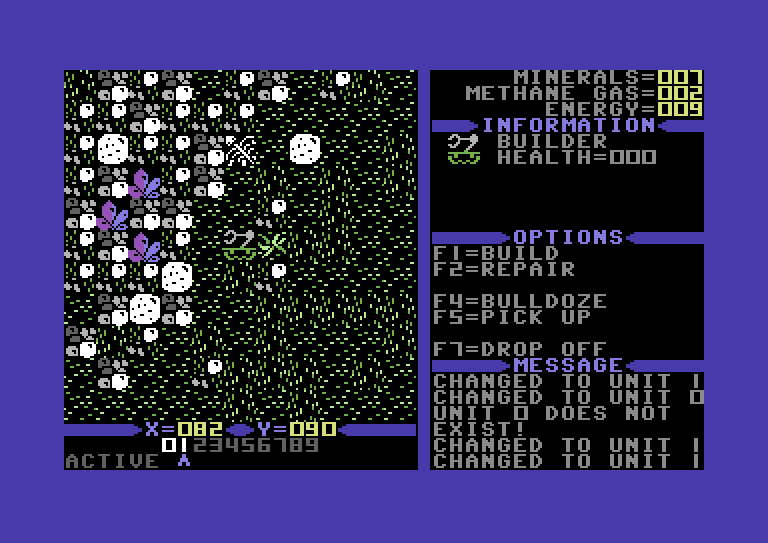 In all of the screenshots, there are noticeable blank areas around the player’s units. 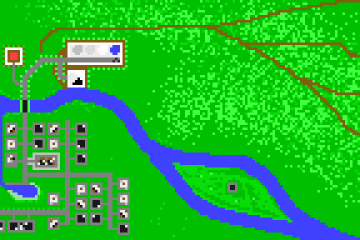 I would recommend using sprites to draw the active unit, and tiles for the other units. On a side note, are you going to release the source code anytime soon? 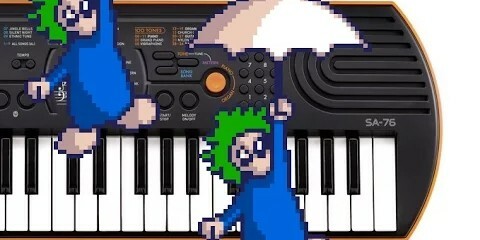 Sprites weren’t easily possible since there could be more than 8 units on the screen. In order to do it would have required a multiplexing sprite routine, which I didn’t have room for. Having just the active unit with a sprite would have seemed odd when all the rest would have squares. I just got this and i really think it would benefit from the joystick aiming the tank is hard when you are being shot at. For a text-mode game, the gameplay and overall aesthetic are awesome. And it’s even a little challenging in easy mode; I still need to learn the game quite a bit. 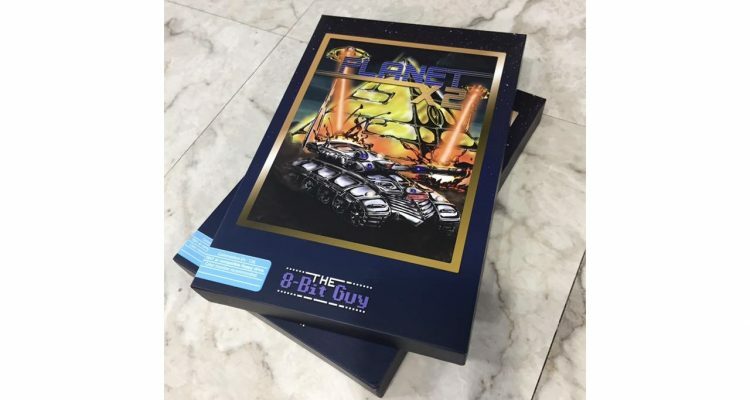 Amazing job, David; I’m glad I ordered…Looking forward to Planet-X3! Not likely. There are much better RTS games for windows. However, playing Planet X3 inside DOSBOX should be a viable way to get the experience in Windows. There have been a few requests for a digital only version. Any chance of that now that the full versions seem to have sold? I would be looking to play on my C64 Mini as my original breadbin and 1541 need a fair bit of work/money to get them up and running again. Jason, the digital version is already available on the website. That’s great. Wasn’t there last time I checked and somehow missed it this time. Great stuff. Will be buying a copy shortly. 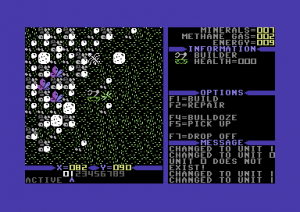 I am not a big player of RTS games but I can’t resist trying one on the C64! Great Game!!! having fun with it!!! !